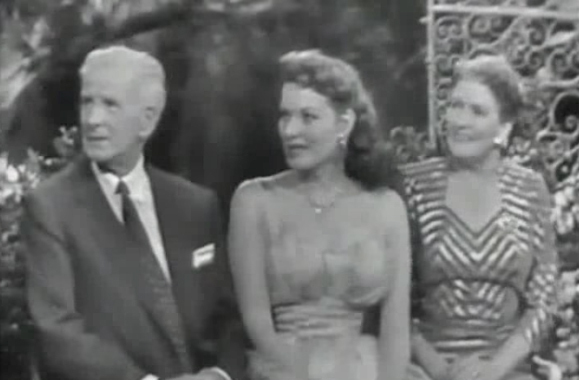 Maureen O'Hara and her parents on "This Is Your Life." “This Is Your Life” ran from 1952-1961 and always focused on the details of the surprise guest’s life in front of a studio audience. The show was wildly successful, in part because the identity of the guest was kept from the public until the show aired live. One of the best parts of the program with O’Hara is when Edwards asks her if she’s ever heard a banshee. It turns out she has. “Oh I certainly have.” She says. “In America, the banshee has been made so much fun of people have come to laugh about it, but it’s very serious in Ireland.” Edwards seems skeptical, prompting O’Hara to give him one of her trademark stern looks. They go on to discuss O’Hara’s parents, Charles Stewart Parnell FitzSimons, named in honor of the famous Irish patriot, who owned at the time a sporting goods store in Dublin, and Marguerite Lilburn, who was a singer. Later on in the program, one of O’Hara’s childhood friends surprises her, Moya Griffin, who was married to the governor of the Bank of Ireland. The two swap memories and reminisce about O’Hara’s love of camogie, or women’s hurling.